Last week, I asked the question of centeredness. You can’t be a Christian for any length of time and not hear someone talking about themselves or their church as being Christ-centered, Bible-centered, outreach-centered, Gospel-centered, and on and on. After a while, it gets confusing to people. I think this clash of centers also explains much about the condition of the Church today and why we can’t seem to see eye to eye on a lot of issues. Two people with two different centers of operation and experience are simply never going to be on the same page. In essence, they are operating out of two different worldviews. All that may not be a bad thing, as variety is indeed the spice of life. But as any master chef will tell you, it’s one thing to understand how to mix spices tastefully and quite another to just throw anything into the pot. Our tendency to do the latter is one reason why lost people sample the stew that is American Christianity and wince. What follows in this post is my opinion. Over the years, I’ve been everywhere on the map on this issue of center. And in each center I explored in the past, I found some glaring problems. Many of those problems stem from simple human nature and our tendency to latch onto one idea and run it into the ground. The idea itself is perfectly sound—under perfect conditions. But the last time I checked, the world wasn’t perfected just yet. And [Paul] entered the synagogue and for three months spoke boldly, reasoning and persuading them about the kingdom of God. And [Jesus] went throughout all Galilee, teaching in their synagogues and proclaiming the gospel of the kingdom and healing every disease and every affliction among the people. And why was the Kingdom so important to Jesus? Because it encompasses all that is seen and unseen. With a Kingdom center, nothing is ignored. It is a truth that maintains a fully systemic expression, not one centered in just one area. As such, it proves more immune to the problems of extremism that may back into a corner other views based on other, more limiting, centers. A kingdom has a king, lands, work, and people. Those people work the land for the king and offer themselves to him as his subjects. They also interact with each other, sharing a collective purpose found within the kingdom. When a king is a good king, he is loved, honored, and obeyed, and his kingdom grows. And as the kingdom grows, the king’s subjects benefit, and he rewards those who faithfully serve him. In a Kingdom-centered Christianity, the Triune God is honored as King, with those who have given their allegiance to Him comprising His Kingdom people. They do the work God has called them to do in the lands that the He has provided, and they proclaim the truths of the Kingdom and the King in those lands. In the Kingdom of God, He rewards those who serve Him ably, because He loves them and is pleased by their service to Him. The lawyer correctly sums up the Bible, and Jesus Himself verifies his answer: love God and love your neighbor. The problem with many of the other centers is that their practice tends to diminish one or the other portion of that summation. Take for example a commonly expressed center. When people talk about being Christ-centered, one has to ask what that center looks like if taken to its natural conclusion in an imperfect world. If history has shown us anything, it’s that the answer can only be monasticism. Few people more devotedly pursued the Christ-centered life than the monastic mystics. Theirs was the sold-out expression of Christ-centeredness, verging on a mysticism few of us understand today and rarely see in America 2009. But such a center, as practiced by these people utterly devoted to making Christ the center of everything in their existence, didn’t leave much room for loving one’s neighbor. Because, honestly, it’s hard to be that specifically devoted without losing something in practice. Especially when you’ve locked yourself away in a monastery so no one will bother your centering. Many people who say they are Christ-centered really aren’t. And that’s not to say they are not devoted to Christ, only that their praxis never truly lines up with their devotion. If it did, I believe it would end up moving toward the monastic mystic lifestyle, where loving Christ is everything, while loving people by truly serving them in a Kingdom manner eventually winds up forgotten. Most of the centers readers listed last week are beautiful and needed. Yet I would contend that they may be too sharply focused, more focused than what even Christ Himself preached. By being Kingdom-centered, we are forced to look more broadly at what defines the Christian life. While that may be messier than some people are used to confronting, I believe the Kingdom center is the only center that holds in real life. It doesn’t allow us to choose a monastic existence or the social gospel. We can’t latch onto parts we like while ignoring those we don’t. Instead, being Kingdom-centered asks us to embrace a larger vision that is greater than the sum of its parts. And that’s an enormous problem because so few Christians, Christian leaders, and churches in America comprehend the Kingdom. Despite the fact that Jesus spoke about it more than just about anything else, I can’t remember the last sermon I heard about the Kingdom of God. We tend to shy away from the Kingdom because it’s so vast. It’s God, Jesus Christ, the Holy Spirit, Heaven, Earth, angels, demons, you, me, us, them, grace, mercy, wealth, poverty, healings, miracles, prophecy, tongues, deliverance, peace, war, love, hate—it just goes on and on. It’s all wrapped up in one very big package that is hard for an adult to grasp (though the Scriptures claim that even children understand it). Despite its enormity, we can’t excuse ourselves from the scope of a Kingdom center, because the Kingdom stretches all through history and into eternity. When I look at the ending of the Scriptures, I see that God’s original intent for His creation is the same at its end as it was at its beginning. The difference is that evil has been utterly destroyed. The kind of Kingdom God created for Man in the beginning is, for the most part, the same kind of Kingdom we will see in eternity. The roles and relationships of God to Man, Man to God, and Man to Man are spiritually the same. There are kingdoms and sub-kingdoms. Work will exist, even in eternity, only it will no longer be under the curse. The Kingdom will persist. All this is why I can’t see any better center than a Kingdom one. If that’s what Jesus focused on, then how can I focus on anything else? You received without paying; give without pay…. WOW! This is almost unheard of in the messages of today. One of the problems of being Kingdom centered is having a biblical definition or conception of the kindgdom. I suggest that many of the politically active, America first Christians of the religious right were kingdom centered, but amiss nonetheless. Various permutations of dominionism have similar flaws. The only center I think can work (sorry, I didn’t comment on that post) is a relational center with God through the Holy Spirit. Jesus described the praxis of such a center, imho, when he said “whatever the Father does, the Son does” (John 5:19-20). Jesus pulled that off without having to be a monk, or living unrelated to the world around him. Obviously, any center is going to have issues, both in practice and in the exclusion of other issues. The problem with a Kingdom center is that we have not kept it framed correctly within the Bible’s idea of God’s Kingdom. Yes, political forces can usurp it, but the Bible strictly points away from that rendering (as in “my Kingdom is not of this world”). As to dominionism, it’s correct in theory, but incorrectly practiced. Jesus Christ DID come to destroy the works of the devil, and we are to do the same. But that does not sanction Christian exclusivism or the idea that we are to set up a Christianized bunker against the rest of the world. I think the Kingdom model preserves the relational better than any other model, as it accounts for both vertical and horizontal relationships. “Whatever the Father does, the Son does – This charge is perfectly at home in the Kingdom model. The King models/directs/says, while the children of the Kingdom do. Another question: if Kingdom-centered isn’t it, why then did Jesus talk about the Kingdom more than anything else? One of the problems of being Kingdom centered is having a biblical definition or conception of the kindgdom. The Bible is the definition of the kingdom! It provides examples of what the kingdom both is and isn’t. How many times did Jesus begin a parable; “The kingdom of Heaven is…” How many of the Psalms explain the traits required for abiding in the kingdom? How often did God provide the directions to the kingdom to the wandering tribes of Israel? The problem is that we simply don’t want to go in the indicated direction. I think as humans that we are prone to reductionism in order to wrap our brains around the complexities of life. Whenever I look around at the Church, I see this taken to extremes. We see Christians stuck in either/or scenarios all the time, unable to locate that middle ground. We see denominations that latch onto one aspect of the Faith and declare that the aspect that matters most. Children grasp the Kingdom implicitly. It’s one reason why so many fictional narratives with strong Christian overtones take place within kingdoms; they resonate with people. Yet we adults attempt to overthink it because we love our granularity. But a kingdom on the order of the Kingdom of God is so vast that we let its minutia overwhelm us. So we go back to our either/or’s and latched-onto denominational positions. Then we battle about what the real center might be. You’re right, though. The Bible IS a blueprint. But it’s a blueprint for EVERYTHING. And I believe only a Kingdom model can account for that blueprint. Anything else ends up missing part of the overall picture. It’s like going to an art gallery and seeing a Bosch painting. Each viewer’s eyes will latch onto bits and pieces of that painting, but other details will be lost, especially if the viewer lingers too long on one aspect. A Kingdom model forces people to see the big picture. I wonder if, as adults, we look back at our lives as children and see life reduced to the simplest of things, and so assume that this is what Christ meant when He told us to be as children. It’s hard to remember childlike faith. I don’t think it’s possible for each of us to be able to see the big picture. We latch onto sections of a Bosch painting because that part is what speaks (for good or ill) to our soul. The trick is to not reject out of hand the rest of the painting, and then to work with others who are drawn to those areas we are not. The body has different parts that work in concert, and we can only be truly “big picture” people in the context of one another. What we tend to do is seek out those who agree with our feelings about that section of the painting. We revel in this “community” and forget that by doing so we are shutting out 99% of the rest of us. 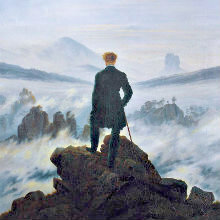 Western individualism comes into play here, in our inability to accept the role of someone else’s vision in our life. We lose so much in our independence. You’re absolutely right on each of us struggling to see the big picture. But where we have absolutely got to change our ways is in naturally assuming because the other guy sees something differently from us that he is automatically wrong. We can’t assume because one part of the picture attracts us that nothing else exists in that picture. We DO need each other, and we need that input graciously—that is , we allow others the grace to be different because their difference makes US better. In the painting illustration, it’s the woman who shows me what I missed: that over in the corner is a man giving bread to a beggar. In the artist’s vision, that detail may change the way we see the whole message of the painting, so if I’m fixated on something else, I may miss that crucial detail. The person who would deem himself cross-centered will help me better understand the cross if he shares with me the benefits of his study on the very thing that attracts him. Same for the Bible-centered guy. And that is exactly what has happened in my life. Like I said in my post, variety is the spice of life. But if we fail to temper those spices and use them correctly (“I prefer cumin, so to counter your oregano, I’m going to keep adding cumin”), the dish of Christianity stew we serve to the world is only going to taste weird. I don’t disagree with you or Dan. The issue really comes down to practice, as with everything related to spirituality. The flesh exerts its perfidious influence subtlely, and even good intentions end up amiss. I don’t know that there any “center” conceptions that can transform us into what we ought to be. That comes by hanging out with God, doing what he does, and having him rub off on us. On rubbing off on us—I hope to write about this in the next week. We tend to shy away from the Kingdom because it’s so vast. It’s God, Jesus Christ, the Holy Spirit, Heaven, Earth, angels, demons, you, me, us, them, grace, mercy, wealth, poverty, healings, miracles, prophecy, tongues, deliverance, peace, war, love, hate—it just goes on and on. I wonder what the Jews thought when Jesus began preaching that “the Kingdom of God is at hand”? Jesus didn’t point to himself and say ‘look at me’. He pointed to God and said ‘repent so you can meet Him’. We tend to look at Jesus as the goal, but Jesus was pointing to something else. I think the Israelites tended to look at the land that way, as an end in itself, when in fact, the promise of the “Promised Land” was not the place, but the relationship between a chosen people and their God. So broad a brush to paint with…So vast a canvas to spread…So infinite the subject in sight. Thank you for describing the Kingdom specifically. Almost all of “Kingdom teaching” I hear today (mostly from postmodern Christians) are vague and leave out Jesus the Savior and HIs work on the cross and what it should mean to us (I’m not talking about a social justice atonement here, but a substituionary one). It’s driven me batty and so I guess I tend to shy away from “kingdom teaching.” Thanks for helping me to understand what it really is. Maybe now I can open up more to it. The cross, the sovereignty of God, the excellency of Christ, the contemporary workings of the Holy Spirit, grace—it’s all accounted for within a larger framework that works against the reductionism we sometimes see. There’s an old children’s book from the ’80s called Tales of the Kingdom, and I think it does a good job as a story that frames how the Kingdom works. Then again, so do the Narnia books. Fiction, yes, but they have a holistic view that mirrors what the genuine Kingdom of God is like in essence, if not in perfect actuality. I can’t argue with this, Dan. Well, good discussions can start anywhere. What would you add to what I wrote? Maybe that letting Christ build God’s kingdom through us is what you and I should be centered on right now … but that it’s possible other folks aren’t ready for that yet – they’re still at the point of encountering and evaluating – and still others are, well, more spiritually advanced than you or I! I’m not trying to be pluralistic for the sake of political correctness – really! – but to point out that we’re all at different stages of life and our walk with Him; we’re all gifted differently. And while service to the King is certainly what we’re all called to do through one Spirit, the ways in which we perform that service may be vastly different. Which might explain why God made elephants and why He made all of us at least a little nearsighted (spiritually) … so we could compare notes like this rather than ignore the pachyderm in the parlor. This is huge for me. I’ve been having this thought the past few weeks, “temporal vs eternal” and kept asking God why these thoughts? I think I’m beginning to see why now. I hear people mention the kingdom but always found it to be a stumbling block because I didn’t really understand what it is. I think few people grasp what the Kingdom is. We need to do a better job preaching it in our churches! Whom is at the very center of the Kingdom? It’s a great theory. So why is it that the most Christ-centered people are often the least Kingdom-minded, while the most Kingdom-minded people are often centered on everything BUT Christ? Well Dan the body that I fellowship with really doesn’t fit that description. We are very Kingdom-minded and Christ-centered, so I can only speak from our point of view. In the gospel of Mark, Jesus announces that the time is fulfilled, and the Kingdom of God is at hand (1:15). His life was a visible view of an invisible Kingdom. He cared for the poor, ministered to the hurting, He loved those who were the least of them. Our body has a reaching-out ministry the feeds the poor, and group of volunteers to fix homes of folks that can’t afford repairs, we have adopted a village in Africa. We are very Kingdom-minded, and Christ-centered, I really don’t see how a true follower could be anything else. You are very blessed to have such a well-balanced church. In my travels and conversations, I have routinely encountered churches that bill themselves as Christ-centered, but are more like country clubs for the saved. None of “those” people need come in. And if “those” people aren’t invited, you know that the church is simply not Kingdom-minded, no matter how much the church’s leaders and congregants might protest that it is. Sorry, Dan, but the Kingdom has been rendered inapplicable and is deprecated as far as the Church is concerned. Dispensationalism has shown that it is something just for the Israel, and since the Jews “rejected” it, it’s all been shoved up to the Millenium, where even then it’s still just for the Israel. Sorry, Dan. It doesn’t apply to us. Of course, I am being sarcastic when I say this, but there is a modest point that I am trying to make, something I’ve always wondered about. If you look around conservative, Bible-believing American evangelical churches, what is the one thing that seems so prevalent nearly everywhere you go? I think you’ll noticed that Dispensationalism is very, very prevalent, and is nearly everywhere. It’s almost inescapable. And you know the part about “dividing” the word of truth. Well, Disp’ists take the “dividing” part of that real seriously, and consequently the Bible has been hacked up into nice, very tidy air tight compartments, none of which have anything to do with each other. So I am trying to make what might to some to be an outrageous suggestion. Perhaps, just maybe, Disp’ism has something to do with the problem, do you suppose? I don’t know, but I couldn’t help but wonder if there’s a connection between the church in America being in such wretched condition (I’m sure you’ll agree with that) and the fact that Disp’ism is so predominant here. Maybe it’s the reason why most xtians don’t have any mental attachment to the Kingdom of God. They don’t think it’s relevant. I wrote a paper about the problems with dispensationalism when I was in college. My prof loved it. I wish I could find it—30 pages of good stuff. I just wish more Christians would entertain the idea that they may not be raptured out of here the second the going gets tough. That ultimate “escapism” renders the Church lazy. Funny, when you get outside the States, few Christians hold that same “Late, Great, Planet Earth” mentality. A very intriguing post! You’ve given me something to chew on – let’s hope I can digest some of it. Now, off topic, but as regards the above comment, I have a question out of curiosity. If you are not dispensational, what view do you hold? (Hope you don’t mind my asking.) I’ve been thinking about this quite a bit lately and intend to do some further study, but for the moment my view would best be described as historic pre-millenialism. I do not hold to a pre-trib rapture (I could have read the Bible a hundred times and never come up with that particular view of the 2nd coming!). I do hold to a literal millenium. I am not amillenial, though I have dear friends who are. None of my views are are that set in stone, though. And back to topic, how does your “kingdom centered” perspective mesh with your eschatological views? I agree with your conclusions about how every other valid “center” fits perfectly into a Kingdom centered world view. Have you read George Eldon Ladd’s “The Gospel of the Kingdom”? Sounds like you are presenting the same basic view of scripture as Ladd does. No, Ronnie, I haven’t, but I probably should. Take Another Look at Monasticism? You express sentiments that are very common among evangelicals regard the monastic life. I would ask you to consider visiting a monastery, or even better, schedule a silent retreat for a weekend, and then see if your perspective changes. I have found the Trappist monks at the Abby of Gethsemani in Kentucky to be very servant minded. In fact, they host hundreds, if not thousands, of retreatants every year who come to stay for a few days, and only ask that for whatever gift you can afford and desire to freely give. The call to the monastic life involves total commitment, giving up of all your personal rights, and the only reward is the inner peace experienced by knowing you are being obedient to the Father. The challenge of living in community with other imperfect men, and following the same schedule six days a week, with only a few hours of “personal time each Sunday afternoon can only be met as one relies upon the empowerment of the Holy Spirit. I believe we, as evangelicals, are in for a big surprise when we look back from eternity upon the life of the church in this world and realize the things accomplished by the prayers of the faithful monastics. Most of these men are also very well read and probably spend more time reading and meditating upon scripture than your average devoted and faithful pastor. Sure, the fact that most monasteries are Roman Catholic present an obstacle for many evangelicals, but I believe if we agree on the essentials of the faith handed down from the apostles, we bear the weight of the scriptural commands to serve and live together in unity. I, for one, am very thankful for the men who are serving the Kingdom by being completely sold out to the King.